It's taken me quite a long time to find a skincare + makeup routine that works for me (remember this confession I had nearly a year ago?). After a lot of trial and error and soul searching, I've finally got this whole "taking care of my skin" thing figured out. Before I spill my beauty secrets, a little bit about my skincare and beauty routine - I keep it very, very simple. I have never used a ton of high-end products, nor am I a heavy makeup wearer. I never have been, and truth be told, I don't think I ever will be. Quite the contrary, I feel my most comfortable when my face is covered in sunscreen and lip balm for hot summer days spent at our cabin or on the lake. But because I can't be outdoors soaking in the sun every day (a girl can dream, right? ), most days call for clean skin and minimal makeup. Let's start with the basics. Each day, I wash my face with Neutrogena's Ultra Gentile Daily Cleanser. 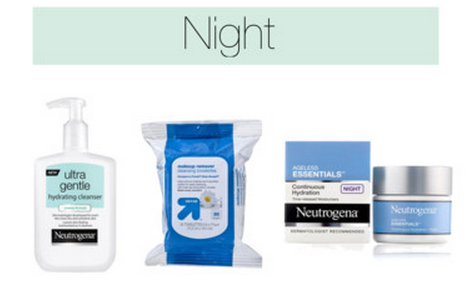 As you can tell by my many, many Neutrogena posts, I truly adore this brand. I grew up using my mom's Neutrogena products well before I could have even dreamed of needing them, and have continued using them to this day. I'm prone to allergic reactions of all sorts, so anything that reacts well with my skin while keeping it healthy is A-OK in my book. After using cleanser and towel drying my face, it's time for makeup primer. I (unfortunately) end up touching my face quite frequently through the day, so using primer is a necessity for me. I'm currently using Smashbox Color Correcting Foundation Primer. It's incredibly lightweight and creates a great foundation for my makeup. Next, I apply two very light types of foundation. 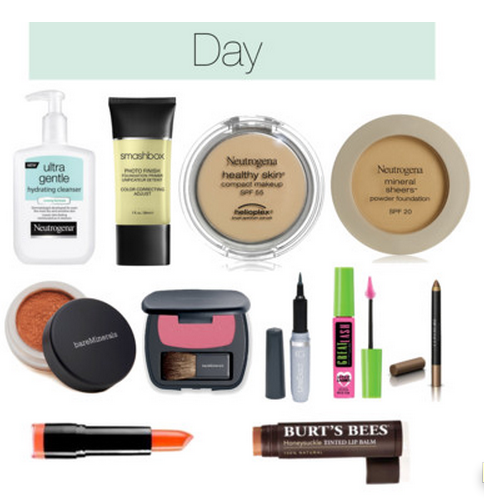 The first is Neutrogena's Healthy Skin Compact Makeup + Broad Spectrum SPF. Not only does it give my skin the polished, even-toned look I need, but it has SPF 55, which is a godsend for me (I frequently forget sunscreen unless I'm at the lake). Next comes Neutrogena's Mineral Sheers Compact Powder Foundation. Since I use only a light amount of the compact makeup, I finish off my foundation with a hint of light powder, which is perfect for sensitive skin types. It goes on light and expertly matches my skin tone, rather than making me look pale and porcelain. For blush and bronzer, I use Bare Minerals Warmth and Bare Minerals "The French Kiss." Two absolute favorites of mine that go on light and clean and make me look all sorts of radiant even in the dead of winter. When it comes to eye makeup, a bit of natural, plain black mascara is usually where my beauty routine ends (I really like to keep my look simple). For mascara, I swear by Maybelline's Great Lash. My mom has always used this product, and while I've tried other mascaras over the years, I've never found one I've liked as much as great lash. Why fix what isn't broken, right? If I'm dressing my look up a bit, I'll add Covergirl LineExact Liquid Eyeliner and Covergirl Shadow Pencil in Melted Caramel. While they're more than my usual makeup routine calls for, the earthy colors help my eyes pop and tend to match with whatever I'm wearing. Lastly, no look is complete without a colorful lip. I either use Nyx Extra Creamy Lipstick, or Burt's Bees Tinted Lip Balm. Do you use any of these products or have others you'd like to share? I'm all ears!